In 2018 our supporters raised an amazing £2500 for us, this includes the fantastic additional 40% that the Kiltwalk give, as well as the gift aid. In 2018 we had 10 supporters walk the Edinburgh ‘Wee Wander’ it was 5 miles for our families, in what turned out to be a wet, but fantastic day. The sense of community and friendship along the walk was lovely. For 2019, we would love to raise even more, and with your help we can! The Kiltwalk ‘Wee Wander’ is open to all the family, last year we had buggies and dogs along with us for the walk, starting at Silverknowes beach and ending up at Murrayfield. 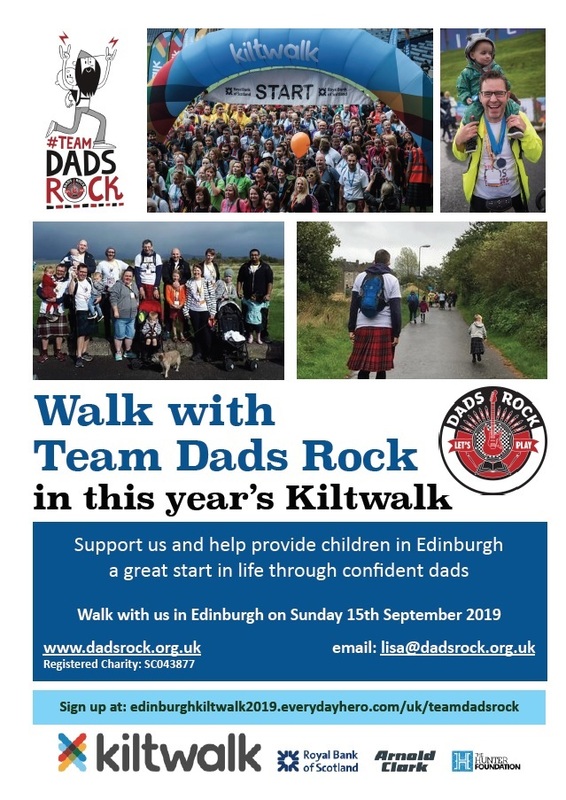 We can offer you a free entry, and a #TeamDadsRock t-shirt. You can walk further than 5 miles if you’d like, there are walks for 15.5 miles, and even 24 miles if you’d like to challenge yourself.